I still can’t bring myself to write about the cross-country ski lessons. Instead, here’s another picture post. I’m in the base building part of the triathlon season. That means plenty of low-intensity work focusing on endurance and form. Over the last week and a half, I’ve done lots of swim drills. I’m trying to imprint better technique by repeating specific actions; when I do the whole stroke, I’ll be able to each part efficiently by habit. What I’ve discovered is that doing all the parts of the full stroke together hides a lot of inefficiency in each part. I get through the water without a problem when I keep my arms and legs moving the whole time, but take away the pulling part of my stroke, and my legs can barely move me. Meanwhile, when I do a drill that focuses just on my streamline, I notice that my legs drop a lot when I raise my head to breathe. And when I do a single-arm drill, I have a tendency to over-rotate . . . to the point of accidentally winding up more than once on my back. Getting better is a process. The drills are the process. 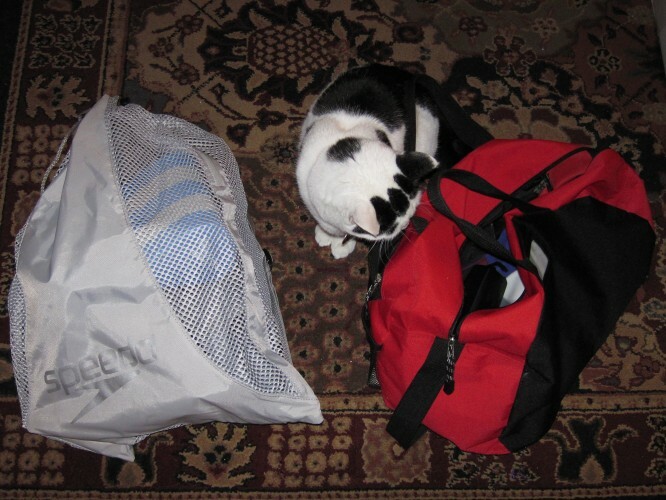 The red bag—which I got at a color imaging conference some years ago—used to be the only one I took to the pool. It holds my towel, toiletries, a little bit of “oh no my BG needs a snack before/after swimming” food, some clothes, a silicone swim cap, and optically corrected goggles. It also has my swim pass and an expired USAT membership card. (In case there’s a triathlon emergency, I guess?) This is all of my dry stuff. The other bag holds all of the stuff I’m going to take onto the pool deck. The mesh bag by Speedo is enormous, and I feel like a dork carrying it, since my pool-mates are all very minimalist. Oh well. Pull-buoy. A flotation device I use to concentrate on the upper-body portion of the stroke and to help develop arm strength. 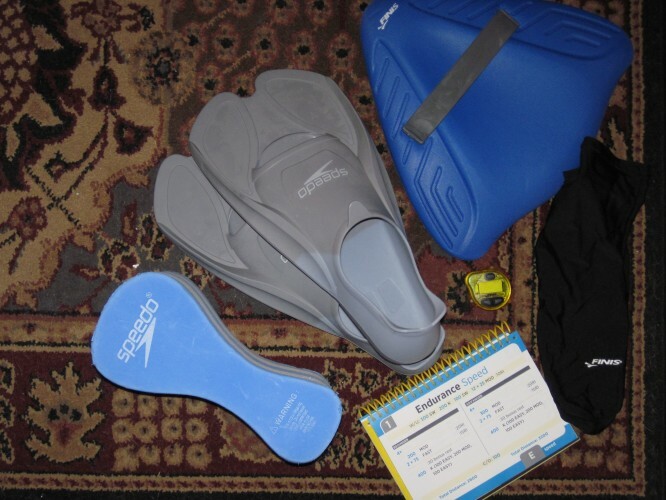 Speedo BioFuse swim fins. I first used fins during the OMG-Early! swim technique classes I did last year. They’re invaluable for streamline drills. Finis kickboard. Unlike a typical kickboard, this helps keep a normal body position while doing kicking and single-arm drills. Swim socks. Yes, I wear these neoprene socks in the pool. I discovered the hard way that it doesn’t matter which size of fins I wear, I’m going to get two blisters in two very predictable places on my left foot without them. So far so good with these “attractive” accessories. Pace timer. A beeping, waterproof metronome that I put under my swim cap to work on my pacing during long endurance swims. I set it for 28-ish seconds and try to time each 25 yard length so that I’m pushing off the wall when it chimes. Going out too fast is easy. Catching up after going out too fast and then slowing down, that’s hard. Swim Workouts for Triathletes. This spiral-bound, waterproof book has lots of great swim workouts for the self-coached swimmer. What do you take to the pool? Dude! Ryan needs one of those swim workout books and maybe that super cool beeping metronome! I’m still wondering when they’re going to invent the waterproof mp3 and earphones. And maybe a way to keep swimming from making me nauseous because I’d love it a whole lot more. Can’t say when they’ll make anti-nausea contraptions for you (Dramamine perhaps?) but they have waterproof MP3 players now. Somebody with a whole lot of money (it would seem) wrote a review of the popular ones. and I really don’t know what to do because I like swimming but it makes me REALLY nauseous after even just a few laps. taking dramamine (or Gravol up here in Canadaland) just doesn’t seem like the right solution. Love the beeping metronome… never seen one before. I think it would drive me crazy though. Plus, I tend to swim longer distances, so to hear that go off about 40 times in a row would take some getting used to. Thanks for sharing the cool gear. I am so jealous looking at your loot bag. I use the pool’s equipment which is fine but not nearly as pretty as yours. The beeping metronome is crazy – I’ve never even heard of those but it would definitely help keep me on pace. And I’m happy to report that I don’t need the triathlete training book as I have my very own (well not really MY own) coach who puts me through the paces.